Welcome to TheGlassCrafter - My internet gallery of hand crafted stained glass hanging mobiles, sun catchers and authentic sea glass set as sterling silver jewelry. I love how glass glows in the light and want to share that with people through my stained glass mobiles and sea glass jewelry. 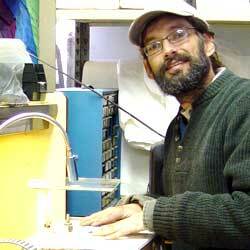 My home studio is located up the Santa Cruz Mountains of California. 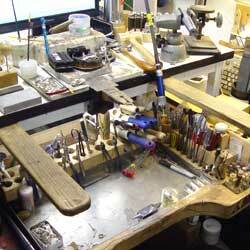 This is where I craft all the wonderful items from glass and metal to provide fun innovative sculptures for all. This has become a great passion of mine so please read on to learn more about me and the items I create to bring light into our lives. As a youngster growing up in Massachusetts I was first attracted to the arts when I learned to sketch and paint with watercolors. My seventh grade teacher brought us to Plum Island and showed us how to render the shadows and depths of the horizon to our paper. Even more, I learned how to see the captured light deep within the ever changing waves. While in the US Navy I served aboard USS Independence (CV-62) as a Quarter Master 2nd Class Petty Officer as part of the ship's Navigation Team. It was amazing living upon the seas, being able to observe the endless skies and powers of the ocean. 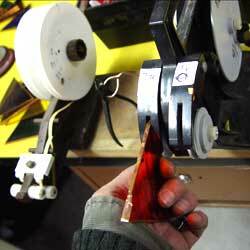 Making Glass Mobiles began after promising my lovely wife a small stained glass window for our front door. The scraps of glass lit up and instantly amazed me. Before I could even imagine the possibilities that stained glass would bring I had made the 'Bicycle in the Rain' hanging glass mobile. Since then, I started to craft other mobiles, butterflies and flower sun catchers. Over time my hobby has turned itself into a business providing these hand crafted items. 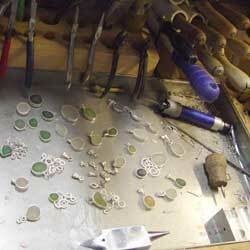 Sea glass jewelry is how my trade as a silversmith began. I was introduced to sea glass by a friend in Saint Martin, FWI. He found amazing pieces of sea glass and suggested I should wrap some silver around these and make pendants. Well, that was the easiest thing I've ever heard. So I thought. 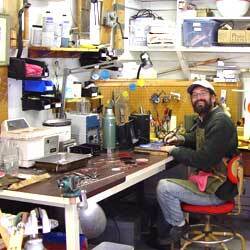 My first formal introduction to sterling silver was by Silversmith Joe Korth at the Clear Creek Academy in Denver, Colorado. I then completed a Jewelry Technician Intensive course from Revere Academy of Jewelry Arts in San Francisco, from Master Goldsmith Alan Revere and Master Jeweler Vasken Tanielian. Now, as bunches of broken sea glass treasures lay wasted, I have mastered the tricks of setting the glass stones. I set the stones banded in sterling silver bezel so the light can travel through them, illuminating the vibrant colors that came from the sea. This treatment, as well as other hand made accents, make my sea glass jewelry stand apart from any other. I look forward to your e-mails and sea glass designs...And I would love to set your sea glass in a personalized piece for you. It will be fantastic creating that keepsake you can always treasure.